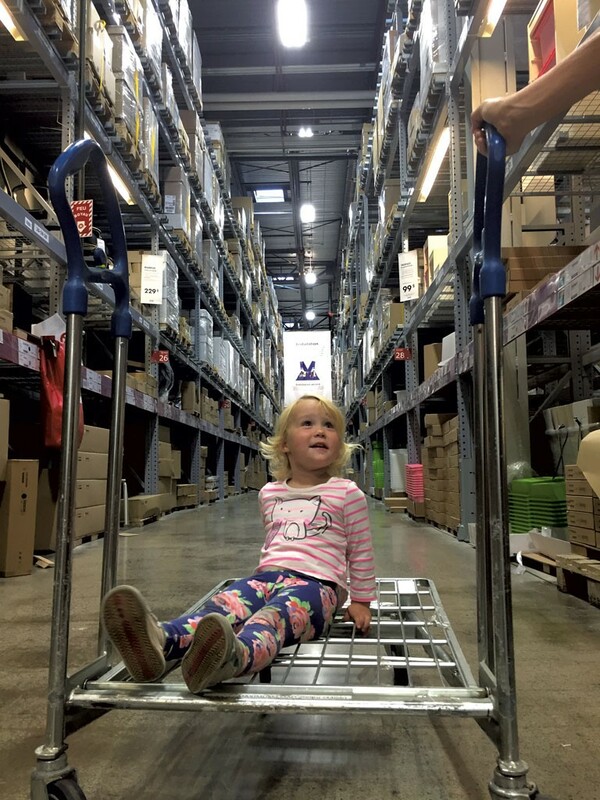 Warehouse Wandering at Ikea Montréal | Destination Recreation | Kids VT - small people, big ideas! When it came time to get my 2-and-a-half-year-old daughter, Joni, her first big-kid bed, I had what turned out to be a brilliant idea: We'd go to Ikea in Montréal. We could have found a suitable bed closer to our Middlebury home, but it's hard to beat the prices at the Swedish retailer. And I thought Joni would love the Ikea experience: the living room arrangements to explore, the colorful bedding to flop upon and — a real treat for my Vermont girl — an escalator. Besides, I had a hankering for Swedish meatballs with lingonberry sauce. So, my husband, my mom, Joni and I piled into our car and headed north. Google said the trip would take about two and a half hours. But construction detours sent us crisscrossing the city, so it took us three. Still, our spirits were high when we pulled into the massive parking lot. We beelined it to the cafeteria, where we watched with amusement as folks pushed lunch trays to their tables on specially designed carts. Joni was literally jumping for joy. We ordered Swedish meatballs with all the fixings, salmon on a grain salad, macaroni and cheese, and an intriguing elderflower juice box. (They also sell wine, beer, and apple and pear cider.) Each entree was under $7 Canadian and Joni's meal came with a voucher for free ice cream, to be redeemed at the store's exit. A good motivator, I thought, to get her through the last leg of the shopping experience. Onward to the children's section. My mom went ahead to scope out the beds while we hung back with Joni, who busied herself trying out every single chair. We came across an abacus, a wooden dollhouse, stuffed animals, plush soccer balls and a toddler-size tent village. Joni wanted to take off her shoes. When I suggested she should keep them on because the floor might be gross, she said, "It's OK, Mummy. This is Canada." And the shoes came off. At last, we reached the beds. Joni dove into one, tucking herself under a rainbow duvet. Then she tried another that was shaded by a leaf-shaped canopy. Her favorite was the "high-up bed," which was perched at the top of a ladder above a cozy reading nook. We made our selection, a simple extendable bed called the Sundvik, then convinced Joni to move on. 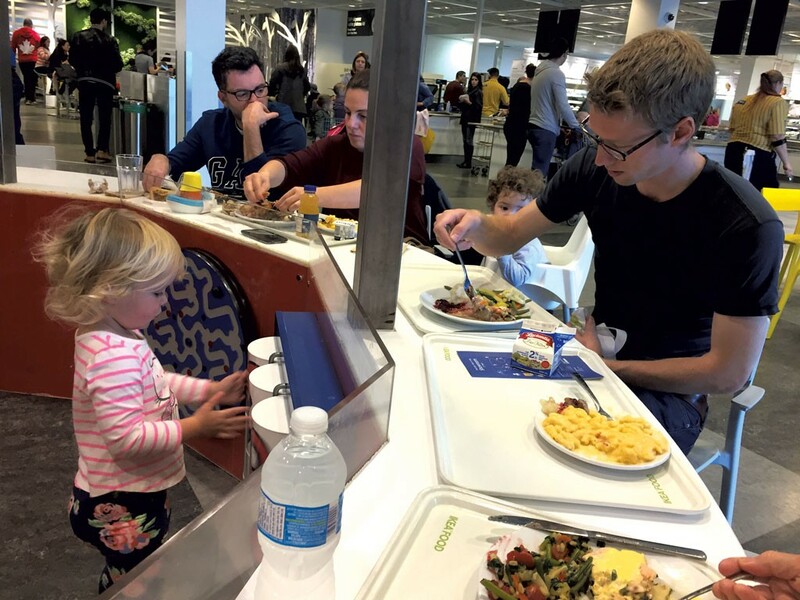 At Ikea, it's impossible to just get what you came for and leave. You have to follow the flow — through the living room displays, the kitchens, the bedrooms, the offices, until you reach "the marketplace," which is where they try to sell you bits and bobs like a 100-count package of tea lights or a potted plant. And by then, you're usually thinking, Get me out of here! Thankfully, my mom turned the trek into a game for Joni: We cruised along the gray walkway chanting, "Follow the gray road!" And just before my nap-less toddler was about to blow a gasket, we found a cart to push her in. Finally, we made it to the warehouse, where we hoisted the boxes containing Joni's new bed onto another cart, then wheeled it (and her) through the aisles. By the time we reached the checkout, we were exhausted — and ready for that free ice cream. The yogurt glacé was only $1 Canadian, so we each got one. On the car ride home, we all drifted into a post-shopping daze. Joni fell asleep to the sound of rain on the windshield, ice cream all over her shirt. It was a perfect day. It doesn't get much better than an outing that's fun for kids and productive for adults. Joni got to play, we all got to eat and we crossed a big item off of our to-do list. If your children are potty trained and between 37 and 54 inches tall you can leave them at Ikea's supervised play area for up to an hour while you shop. On the Sunday afternoon we visited, it was crowded and chaotic. If you have a toddler who bolts, you might want to bring a stroller — or a leash.